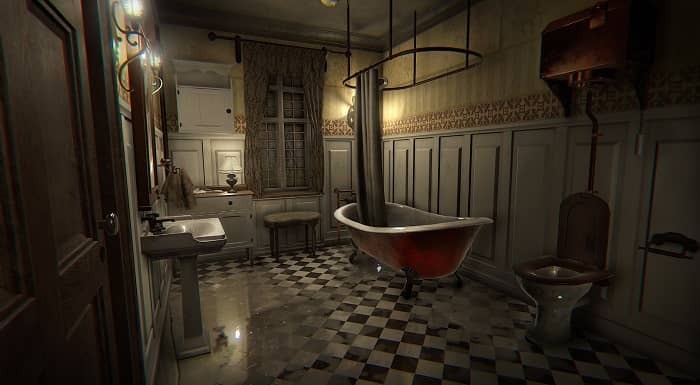 For those of you who have played the Victorian psychological horror video game Layers of Fear, you know that the story can be a bit tricky to piece together, and there is plenty left to our imagination. I love things like that, so naturally I’ve thought about all the pieces of the puzzle a lot and put them all together to get this storyline. Let me know if you think it went differently! When we’re in the attic, there’s a fire burning below us. If you pay attention, you’ll see it’s in a bed. I think we set fire to our wife’s bed to get her out of the picture. A fire looks like an accident, so that could get us off the hook in terms of suspicion of murder, especially in Victorian days. This is never stated right out, but that’s what I think happened. Well our wife survived but was severely burned. She’s left with what looks to us like a frightening grin caused by the burns on her face. Between the fire we set and what we interpret to look like a creepy grin caused by our own fire, I think that’s what sets us off on the path of crazy. Now, when did the baby happen? According to the pictures on the baby’s wall that we see later in the game, it happened after the baby was born. We see a happy family first, then in the next drawing, our wife is in a wheelchair and we look angry. Then we see that we killed our own dog. I don’t think that’s just craziness, I think it’s also our frustration and anger at the whole situation. We have a helpless woman and child depending on us, plus a dog. We didn’t want anything to rely on us – remember, we were having an affair and doing really well with our paintings – so the first step is the dog. Foreshadowing. We find out our wife left us nasty notes about our art after the fire, and that makes sense since she’s so angry, right? Wrong. We left those notes to ourself and signed them from her as our excuse for murdering her later. This is where the crazy officially starts to take over. This becomes clear once we see our own criticism of our paintings, art critics’ criticisms of our paintings (our talent clearly tanks as our sanity does), and we remember our tone of voice becoming angrier and angrier, especially regarding our talent and our wife. So we create notes “from her” that give us a good excuse to get rid of her. And that’s what we do. On to the baby. Once we’ve killed our wife, the baby is left entirely in our care. Well that’s not good. We’re always angry at our baby, giving it lots of toys to make up for all our neglect. Nevertheless, the baby feels the neglect and hatred coming from us, and that’s why there are so many toys and baby dolls and heads floating around presently – or so we think. That’s all in our head in reality. We see the baby float up in the bathtub twice. I think we took the baby for a bath and drowned it. We were probably drunk at the time – we have a problem with alcohol too. That’s my take on the storyline! If you’ve played this game or watched it being played, let me know whether you have the same or a different interpretation. I loved taking this apart layer by layer. Games like this are few and far between. This entry was posted in Something Else and tagged 1800s, 19th century, artist, aspyr, disturbing, disturbing video game, insanity, interpretation of layers of fear, layers of fear, layers of fear lets play, layers of fear plot, layers of fear storyline, madness, mature game, painter, psychological game, psychological game story, psychological video game, storyline for layers of fear, victorian, victorian era, victorian times, victorian video game, what happens in layers of fear.